We went in for my 20 week ultrasound yesterday. Before we went in, we asked Jellybean and Buddy if they thought they'd be getting a little brother or a little sister. Buddy was dead set on it being a baby brother and Jellybean was dead set on it being a baby sister. Those two kids are pretty opinionated. Jellybean even stated that she wouldn't share her toys if it turned out to be a boy. We've had a lot of conversations about that and it's good that we did. We found out today that we're having a BOY! Fortunately, Jellybean is the type of girl that will be able to hold her own between two brothers. Jellybean got to come with us to the ultrasound while Buddy went to preschool. She snacked on her goldfish and nodded sagely as the doctor pointed out different parts of the baby's anatomy. Then she repeated technical words as if she'd also earned her medical degree. We may have over estimated her medical knowledge, however. When D asked her where her brain is and she answered, "I don't have a brain." 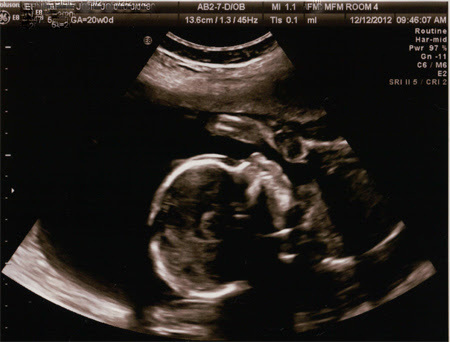 I don't think I'll ever get over how amazing that ultrasound is. The doctor even zoomed in so we could see the baby's mouth making sucking movements. He looks perfect. I can hardly believe that we're halfway there! When we walked out of the hospital, D commented, "Now, the hard part begins." I was a little confused as I'm pretty sure I'm currently doing "the hard part". Then he stated, "Now we have to figure out the name." I have the opposite of you! I have a girl, then a boy, and my next girl is coming in 8 weeks. That's so exciting! You're almost there, too!